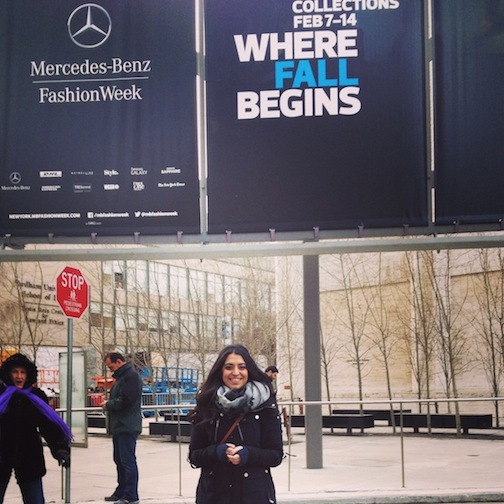 BFA Fashion Merchandising student, Breanna Castro, at Lincoln Center during Mercedes-Benz Fashion Week in New York. With the School of Fashion’s Fall 2014 Show just weeks away, today’s “Student Spotlight”, takes you behind Fashion’s front lines at Mercedes-Benz Fashion Week with 2014 BFA Fashion Merchandising student, and co-President of the fashion club Beyond the Front Row, Breanna Castro. In addition to assisting backstage for the Academy of Art University February fashion show, Breanna is also gearing up for her fifth season volunteering during fashion week as part of IMG’s Mercedes-Benz Fashion Week Volunteer Program. Today’s she’s sharing with us the tips and tricks she has learned backstage to get each collection runway ready. What was your first “fashion” purchase? My most significant was actually on a family vacation when I was in the ninth grade. We were in the back woods of Kentucky, and ended up going to an estate sale. I picked up pair of earrings that had a set of black and gold discs dangling from them. They were vintage Chanel! When I asked how much they would cost, the guy didn’t even realize what they were! He sold them to me for 50 cents! Once we were home, I took them to get appraised and they were verified as real! Well, besides scoring Chanel for 50 cents, you live so many fashion students dream every season volunteering with IMG for Mercedes-Benz Fashion Week. How did you make that happen? I moved to San Francisco two years ago when I started at Academy of Art University. I joined the fashion club, BtFR, and had my first volunteer experience working the Graduation Fashion Show and Awards Ceremony. I LOVED it and wanted more opportunities to work, so I started researching how I could go to New York for Mercedes-Benz Fashion Week. I applied in September of 2011 for the Fall 2012 season the following February. In November, I received an email that I had made the first round of cuts. Out of 4,000 applicants, 300 had been selected. I had two phone interviews, and received confirmation in January that I had made it! Five weeks later, I was on a plane to New York to work Fashion Week. I worked six of the seven days at Lincoln Center, 10-11 hours each day. Any moments that you were a little star struck? I saw Kelly Cutrone the first two days I was there. I was backstage setting up for hair and makeup for her designers. I also saw Taylor Momsen from Gossip Girl! 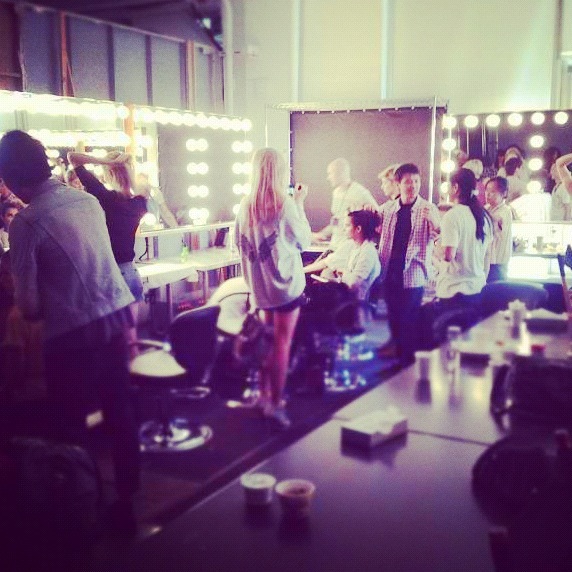 Backstage at Mercedes-Benz Fashion Week. How do you feel your involvement with Beyond the Front Row helped prepare you for MBFW? Because of the volunteer experiences through the club, I already knew what I was doing backstage such as being able to set up the makeup tables and rolling racks, unpack the clothes, getting garments ready for dressers, etc. For the first show I worked on, they gave me more of a leadership role and I was responsible for all of the seating cards. I had to organize by section, and make sure they were set up according to the designer’s exact preference and specifications, a really critical part of any show! Wow! 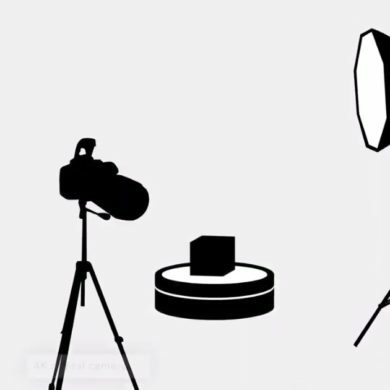 It sounds like you’ve done almost everything that goes into producing a fashion show! Is there a certain task that’s your favorite? That depends on the shows. I love working in the front of house. Being out front requires you to be more detail oriented, and you have to be very mindful of how you’re interacting with the invited editors, and VIPs. But, dressing is exciting because you get to see the final looks before they hit the runway. It’s nerve wracking on that level, because there are more eyes on you backstage. I was working the Monique Lhuillier Fall 2013 show, and one of the dressers did not properly buckle a pair of shoes. As soon as the model stepped on the runway, she teetered as she began her walk. She made it down the runway but, when she exited, she fell into the back wall. And she was the last look! Sitting near editors, you could overhear them saying “That model’s not getting signed again.” The dresser not outfitting her properly had compromised her career, and it wasn’t even the model’s fault! So, there is great pressure in being a dresser, and the pressure of the one who did that to that poor model must have be terrifying. Organizing run of shows and seat assignments (left) and Breanna’s volunteer pass c/o IMG. Did working Fashion Week live up to your expectations? I truly didn’t realize what I had signed up for! I knew it was Mercedes-Benz Fashion Week in New York, and that I would be working. We were the very last people to leave a show, as we were responsible for all of the clean up such as taking down seat cards that we meticulously set up just 40 minutes before, and collecting the goodies bags that were left behind. We only had three hours to flip a show, which sounds like a lot of time, but it’s not! The production team has to rip out the old runway and install an entirely new one for each show! Even if the next show’s setup will be the same in the venue, if a runway has been walked on, it’s got to go! All right, you head to Fall 2014 Fashion Week in just a few days. What three things do you have to pack? Do I get three suitcases? Actually, I take that back. I only want one because lugging your bags up walk-ups in NYC is no joke! My three must have items would have to be black skinnies, ankle boots, and MAC Lipstick in “Candy Yum Yum”. No matter what show or season, even when you’re wearing a volunteer t-shirt, it’s important to accessorize. No one is paying attention to you, but people still see you. To learn more about volunteer opportunities at Mercedes-Benz Fashion Week, contact mbfw_volunteers@cfda.com. For more “Student Spotlights”, click here.